Almost every business in every corner of the globe is exploring business paper saving initiatives. However, certain professions such as legal, education and healthcare still involve people carrying around reams of paper and in many cases several ring binders. Instead of buying ten iPads for a department, I have often wondered why businesses do not align their technology with business objectives. For example, if a department was using excessive amounts of paper, wouldn’t it make more sense to invest in something like Sony Digital Paper to actively reduce paper consumption in that area. Organizations could save money and make their business more efficient by focusing on how to reduce their business waste. These are just a few reasons why I have been following the Sony Digital Paper product line very closely. Sony Electronics continues to expand and enhance its Digital Paper product offering with the release of a new “notebook-sized” 10-inch model. The new model (DPT-CP1) gives customers the same high-performance reading, annotating and note-taking capabilities they have enjoyed with the original 13-inch letter-sized Digital Paper (DPT-RP1). Taking into consideration recommendations from customers and the company’s intent to continuously improve the overall experience, Sony also announced the new Digital Paper Mobile Application, as well as additional feature enhancements applicable to both the new 10-inch, notebook-size DPT-CP1 and the current 13-inch, letter-sized DPT-RP1. The addition of the mobile app and feature enhancements promotes the integration of Digital Paper into customers’ day-to-day lives, helping to reduce volumes of documents and notes, and advancing their quest to achieve a truly paperless workflow. Screen Capture/Display Output Mode2 – Connect via PC or Mac to a projector and display the contents on the Digital Paper screen to a larger audience, including real-time handwriting and mark-up. I last spoke to Daniel Albohn, Global Business Development at Sony North America back in episode 277, but I wanted to catch up with the latest developments at Sony. We discuss how the team is continuously evolving the product after listening to customer feedback and the new Sony Digital Paper Mobile Application. I can’t believe how little Sony has improved new firmware on the DPT-RP1 Digital Paper which is the only firmware release in past 12th month since the introduction. Sadly Daniel Albohn is only marketing person with zero influence on Japanese management. 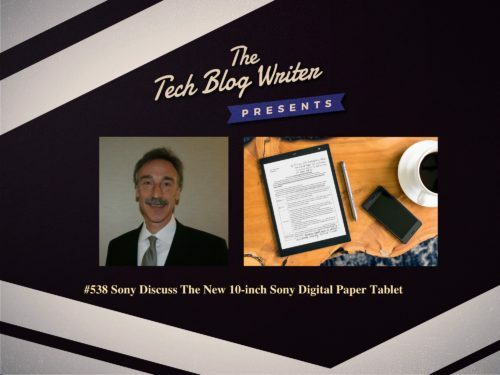 Perhaps you can ask Daniel in June 2019 the third time about Bluetooth connectivity between Sony’s Digital Paper and wireless page turner in this sweet talk.